Veličina ovog prikaza: 468 × 599 piksela. Druge rezolucije: 187 × 240 piksela | 375 × 480 piksela | 468 × 600 piksela | 600 × 768 piksela | 800 × 1.024 piksela | 2.327 × 2.980 piksela. The hiker stands as a back figure in the center of the composition. 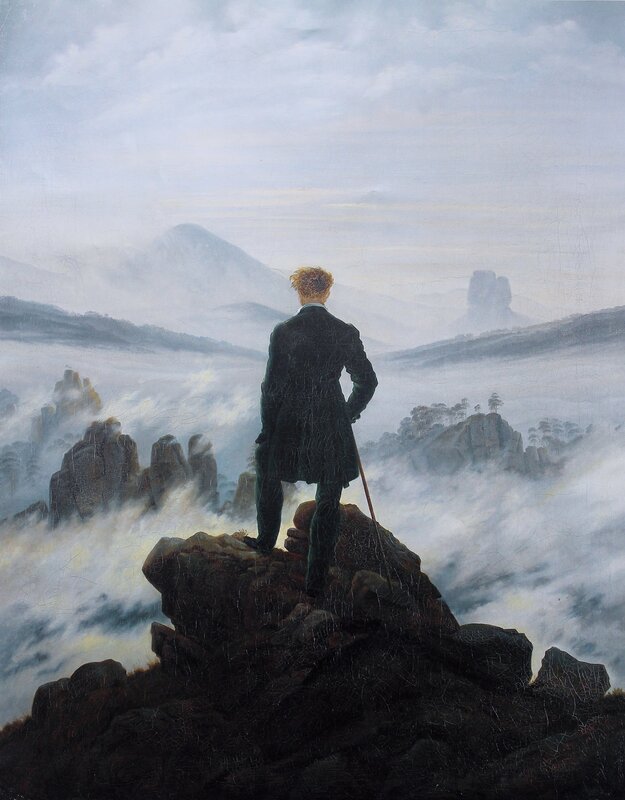 He looks down on an almost impenetrable sea of ​​fog in the midst of a rocky landscape - a metaphor for life as an ominous journey into the unknown. Beleške The artist himself undertook a hike in the Saxon Switzerland and presumably realized the impression of nature in the picture. Čeština: Obraz Poutník nad mořem mlhy od Caspara Davida Friedricha, kolem roku 1818. Dansk: Der Wanderer über dem Nebelmeer af Caspar David Friedrich, ca. 1818. Español: El caminante sobre el mar de nubes, pintura de Caspar David Friedrich. Français: Le Voyageur contemplant une mer de nuages de Caspar David Friedrich, vers 1818. Русский: Картина Каспара Давида Фридриха „Der Wanderer über dem Nebelmeer“ («Странник над туманным морем»), около 1818 г.
Auf dem Gipfel als Ziel seiner Wanderung bedenkt der Mensch seinen Weg, den er hinter sich gebracht hat. Das Bild ist eine Analogie auf das Leben eines jeden Menschen.